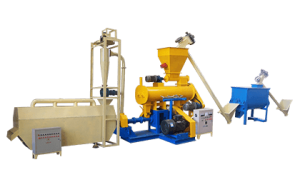 As its name suggests, automatic packing machine is designed for bagging products, such as fish feed pellets, organic fertilizer, compound fertilizer, white granulated sugar, seeds, grains, wood pellet, and other animal feed pellets. In fish feed production, especially large-output fish feed manufacturing process, fish feed machines work continuously. Due to fish feed pellets small in size, if not being stored properly, the quality of pellets will be affected, further impacting the nutrition in fish feed pellets. 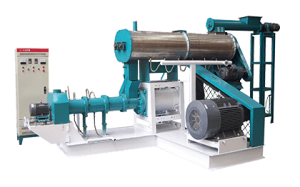 A cost-effective industrial packing machine protects fish feed from being polluted during transportation and selling. It can realize package standardization, greatly decrease labor cost, and meet large-scale production requirements. All those characteristics make fish feed packaging machine an indispensable part in fish feed production plant. Fish feed packing machine is comprised of a storage bin, vibratory feeder, a weighting bucket, filling funnel, an electronic control cabinet, framework and the like. First, the fish feed pellets in the storage bin fall into the vibratory feeder. 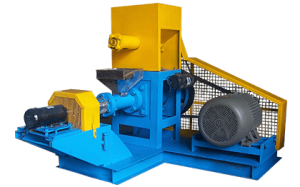 Vibratory feeder works with 50Hz vibratory frequency, and equably to bring pellets into the weighting bucket. When the weighting bucket reach to the set point, the vibratory feeder stop to bring pellets into the bucket. Then the filling funnel will pour the pellets which have been weighted in the weighting bucket into the bag. At last, the bag is sealed, and the packing ends. 1. Check the oil tank before turning on the machine. We can add oil according to the temperature of the bearings and service behavior. 2. The turbine case must store machine oil, and the turbine should be totally immersed in the oil. Change the oil every three months if the machine is used frequently. 3. Do not add too much oil in case of the oil comes out of the oil tank and pollutes the materials and products. 1. Examine every part of the machine every month, especially the turbine, worm, bolts, bearings. Do not use the machine if you find something wrong with it. 2. Place the machine in a dry and clean room. It is not suitable for using it in an acid or corrosive environment. 3. After finishing work, we should clean the inside of the machine. If you are not going to use the machine for a long time, we should clean the machine totally, and smear the machine with anti-rust oil. Then shroud the machine.